Miracle Foundation India has successfully raised funds & reached the goal amount. We thank all the 190 generous supporters for their kindness. Miracle Foundation India is an NGO that brings life-changing care to the world’s children without parents. Helping people help themselves is the most sustainable way to affect real change. That’s why we focus on redefining the role of orphanages and giving purposeful employment to local people in need of work. Together with our supporters, we transform institutions into homes, provide clean water and quality healthcare and fund scholarships for education. Our goal is to have each child become a healthy, happy, income-producing person – and break the cycle of poverty. Empowering children without parents starts with you. Our method is straightforward, replicable and proven. We help struggling children’s homes with a lot of heart, but not enough resources to feed, clothe, nourish and educate their children. We combine passion of the heart with sustainable practices of the head. We don’t just fund an institution and move on, we closely monitor and mentor every home – and every child – in our program. Honed over many years, our method measures progress and replicates success. We work toward a common goal of providing a loving home, a quality education and a promising future to each and every child. Because when you bring together those who have, with those who have not – miracles happen. 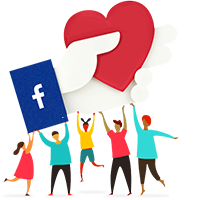 Visit MiracleFoundationIndia.in to learn more about our work and the children we support. Feel free to ask Miracle Foundation India for a new update on this Fundraiser. We have raised nearly 70% of our campaign goal. A sincere & a heartfelt Thank You to all of you who have helped us reach this mark. Your contribution will help in the livelihood of so many children. Also a reminder for all of you to come tomorrow to The Bombay Canteen and be a part of this lovely initiative. Please continue sharing this campaign and help us reach our campaign goal. All donations made are 50% Tax Exempted. Thank you very much once again. After raising 7 lakh at last year’s daawat, and feeding 540 lovely guests, it’s time to give and feast again at our 4th Independence Day Daawat this 15th August from 11:30 am to 3:30 pm. Get your flags out, paint the city in tricolour, and swing by to celebrate all things Indian this Independence Day, with good food for a good cause! And if you can’t make it for the good food, here is how you can contribute to the good cause. 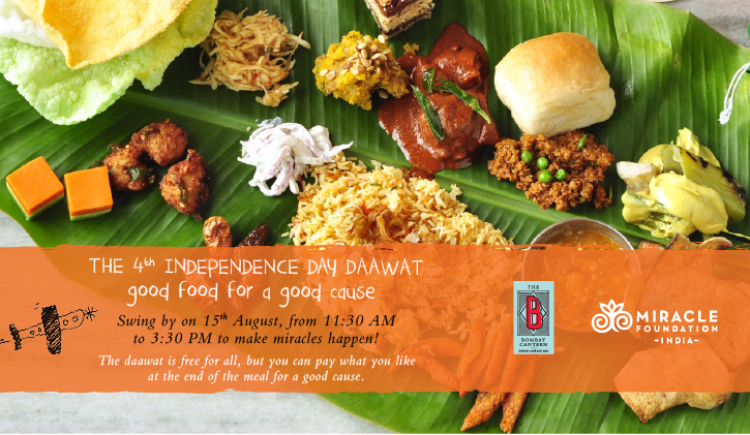 At The Bombay Canteen’s 4th Independence Day Daawat, as we make the tasty khaana, you get to make miracles happen! Miracle Foundation India turns an ordinary child care institution into a Miracle Home by helping the bacchas thrive in real time by ensuring that they are educated, fed, loved and feel safe. The Bombay Canteen’s initiative to support Miracle Foundation India is one that seems like a perfect match! We’ve always wanted to share the love we get from our guests, and the kids at the Miracle Foundation India deserve all the pyaar and support they can get. The Bombay Canteen is a café and bar that is Indian at heart. Housed within the bustling metropolis of Bombay, it prides itself on recreating local dishes and reinterpreting age-old Indian traditions, to create an experience that toasts the old times and celebrates the new. The food presents the classic yet unexplored charm of India’s diverse regions, marrying them expertly with familiar flavours. And the drinks are a unique selection of reimagined classic cocktails with firm Indian roots. Each dish and drink has a story to tell, promising you an exciting journey on a plate (and in a glass)! Miracle Foundation India is an NGO that brings life-changing care to the world’s orphans. Our mission is simple. Miracle Foundation India stands for orphaned children and helps them thrive in real time. We’ve created a measurable, repeatable and systematic method to ensure that orphans are educated, fed, loved and safe. At the same time, we explore every avenue to reunite them with their parents or relatives, when possible. Our goal is for every child to live in a loving family; to become a healthy, happy, income-producing person—and experience a true sense of belonging. Your message will be directly emailed to Miracle Foundation India and you will receive his/her response on the email address entered below. Additional proteins will keep the kids healthy and happy! They jump, they hop, they skip. Let them grow up with good physical health and countless memories! Let nothing stop these girls from achieving all they are meant for, and certainly not the lack of transportation!